NEW BRITAIN - With the winter season well past the halfway point, athletes are putting their focus on qualifying for the postseason. 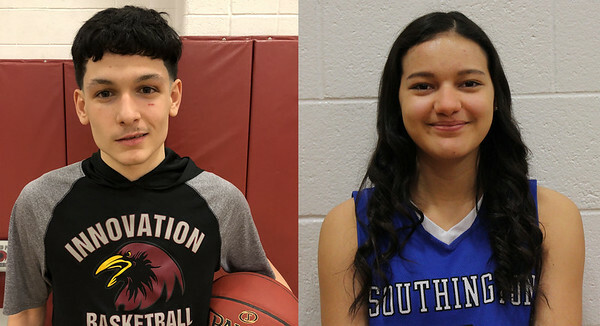 Southington’s Brianna Harris and Innovation’s Carlos Gonzalez have both helped their respective teams get the wins needed over the past week to reach the postseason. The Innovation boys basketball team qualified for the first time since the program began (initially as Med-Ed Prep), in 2015. The Ravens secured their spot Wednesday night, as they beat Achievement First 60-28. Gonzalez led Innovation with a game-high 16 points that evening. Gonzalez’s efforts were also effective Friday evening in a close back-and-forth battle against MLC. Gonzalez scored 21 points, including five 3-pointers. Gonzalez wasn’t just a shooter Friday night. He found other ways to contribute, including getting his teammates involved. The Southington girls basketball team won its most recent game, against Newington, 50-33, and Harris was a helping hand. Harris scored a game-high 18 points, 16 of which came in the second half. Of those 16 second-half points, nine came in the final quarter. Harris has been a lot more aggressive with her rebounding, especially when she’s going after loose balls. Harris and Forgione talk all the time. There is so much more to basketball than trying to score and she has bought into that concept and continues to improve in all aspects of the game, that don’t always show up on the stat sheet. Harris always puts her teammates first and does whatever she can to help the Blue Knights continue to be a successful program. Posted in New Britain Herald, Athletes of the Week, Innovation, Southington on Monday, 5 February 2018 22:51. Updated: Monday, 5 February 2018 22:54.